”Crime”, ”atrocity” and ”fucked up” are the terms most associated with Fred Vogel’s infamously notorious August Underground series, and sometimes they’re meant as compliments. Some would even go as far to call it art, where as others would dismiss it as exploitation trash from a demented hack with murder fantasies. It was curiosity that led me to watch the first of the three movies more than anything; pseudo snuff films aren’t to my taste at all, but after reading so much about them for years, I decided to finally take the plunge. Truth be told, I didn’t enjoy it at all; in fact, I didn’t feel anything. As nasty, brutal, disgusting and realistic as the events taking place are, the lack of plot, character development and engaging dialogue make the atrocities ineffective. However, to dismiss its artistic merit is something I don’t agree with. 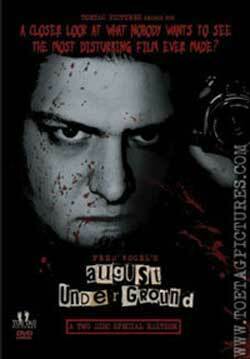 August Underground documents two serial killers as they go around causing havoc; getting in fights, torturing captives they have looked in their basement and being all round cunts is just their daily routine. One of them films their activities at all times, whether it’s going to concerts, assaulting people or viciously killing them. That’s the plot in a nutshell, or lack thereof. Not that it matters because the intention of this movie is to provide a realistic account of the activities of evil people, and in those regards, it does. The characters are completely authentic: the two killers converse and laugh like 2 young men would, sharing an undeniable camaraderie and affinity for their actions. The day-to-day video diaries of their antics feels homemade and everyone they encounter, whether a victim or a passer by, seems true to life. On top of that, the special effects don’t look fake in the slightest, so if you showed it to somebody who wasn’t in the know, it’s highly possible they’d believe it was a real life snuff film. Once again, kudos to those involved. Fred Vogel set out to make a nasty film which depicted serial killers how they really are: it is supposed to be a dirty documentation of sick people committing vile atrocities that’ll make the viewer feel uncomfortable. The message is to remind us that there is real violence out there and it isn’t ”fun.” As horror fans, we’re used to finding glamour in wickedness and this is a reminder that there are deviants out there who we should not adorn. That’s the artistic merit of August Underground; it sets out to make a statement with brute force, and while not being to most peoples tastes (including my own), it succeeds with its message. That being said, there’s only so much women being force fed their own feces and brutality I can take before I stop caring. Personally, I’m only disturbed by movies if I form an emotional attachment to the characters somehow. If I didn’t know this was fake it’d be another matter, but amazing special effects aside, I knew it wasn’t real and the lack of any real substance made it a chore to sit through. Out of all the negative comments I’d have for this movie, I didn’t expect boring to be one of them. I went in to test my endurance for vile atrocities, not for seeing how long I could watch without falling asleep. If curiosity leads you to August Underground, be prepared: if curiosity did kill the cat then this movie ensured it was subject to torture before it died. Through boredom or induced vomit killing you depends on your stronghold, whiskers. Not without its merits, I’d say avoid this unless you’re a fan of simulated snuff. Fred Vogel has evolved as a filmmaker since, making gore flicks with drama, characters and storytelling narrative. I look forward to seeing those because his talent is evident. 5/10.